I took the basic seasoning from Rufus’s post: lots of rosemary, garlic, some chili powder, some cinnamon, and added a healthy dollop of Colman’s mustard powder, salt, and added enough oil to make a very thick paste–heavy on the rosemary. The shanks were rubbed all over with this, and then allowed to stand (refrigerated) for about 18 hours (overnight until ready to start the smoking process). The Weber kettle grill was set up with a pan in the middle with water in it; then added hardwood charcoal briquettes (unlit on both sides of the pan. These were topped with lit briquettes, and the soaked hickory wood chunks. Vents were adjusted for a nice slow fire. I opted not to use a mop sauce this time–may well try that on the next round! But soon there were wonderful smells wafting from the grill–smoke, rosemary and lamb. In an effort to keep the day as simple as possible (read to avoid dish washing, either by guests or me) there were disposable plates. Although I really did have a platter set out on which to serve the shanks, they never made it into a serving dish since we were being so casual; hence, picture of shanks in the pan that was used to bring them from the grill. The results were fantastic. 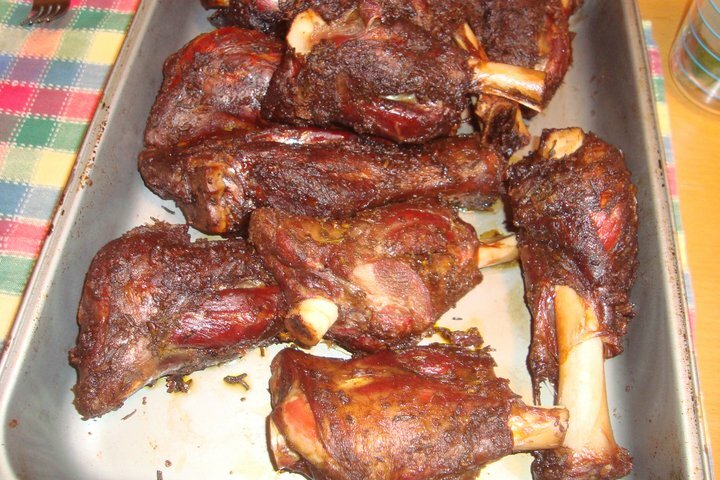 (The goat shanks are the two in the front of the pan–the rest are lamb). The seasoning was there, but not intrusive but complementing the meat– the hot mustard added some “spice” and “zing” without ever seeming “hot”. For those of us who wanted wine with the meal, we had a 2008 Marcillac Rouge “Lo Sang del Pais” (Domaine du Cros)…this was not the wine that I had bought to serve. My mistake–it was a bottle from my cellar that I considered before I decided to go visit the Wine Authorities. They suggested 2008 Rouge “Cuvee Jericho” Vin de Pays (Mas Montel (Mas Granier), France, that I bought. When I was setting up the serving area, I put out the Marcillac (my original intention) instead of the Jericho (80% Syrah and 20% Grenache)! The Marcillac was awesome with the lamb shanks–it’s 100% from Mansois (Fer Servadou) grape. So I still have a bottle of the Jericho (and some “leftover” lamb shanks–that may well be supper this evening. This is something I’ll do again, soon…the smoke flavor was not overwhelming, but very complementary to both the lamb and the goat and it was low-maintenance cooking, thought it took about 3-1/2 hours, that let me visit and relax while preparing it. Perhaps the next thing to get smoked will be a goat leg. The vendors from whom the goat shanks were purchased said that they had recently tried smoking a leg and it was excellent. I’m glad that I discovered the post on smoking lamb shanks–and the associated information on smoking. If there are “leftovers” after this evening, I think that those might end up in something with white beans for sort of a mini-cassoulet (for a hot dish) or maybe even a white bean salad–we’ll see what evolves. I think there’s more smoking in my future–and I’ll be learning to make the gazpacho that we had with this meal too! You get a lot of rsepcet from me for writing these helpful articles. Hi there! This is my first comment here so I just wanted to give a quick shout out and say I truly enjoy reading through your posts. Can you suggest any other blogs/websites/forums that go over the same topics? Thanks for your time! Located your website through Yahoo. You know I will be signing up to your feed. So glad it worked out for you. I like the inclusion of mustard and both wine pairings sound great. I now want to try a goat leg too.